Looking for a LARGE 6 bedroom home with a MUST-HAVE 3 car garage in a highly sought after GATED COMMUNITY on a CUL-DE-SAC street that sits on a tranquil POND FRONT home site with a large FENCED in back yard? The entire exterior of the home has JUST BEEN PAINTED and BRAND NEW CARPET installed. This EXECUTIVE STYLE home features all large bedrooms including a FIRST FLOOR BEDROOM with a FULL BATH just outside its door for an elderly parent or independent teen. Just wait till you see the size of the MAPLE CABINET KITCHEN (21x16) with loads of 42” cabinets and GRANITE COUNTER space, center island, ceramic tile floor, 2 pantry closets, can lighting, recipe/work station and a good sized breakfast nook. Just off the kitchen is the HUGE FAMILY ROOM with beautiful ENGINEERED HARDWOOD FLOORS and access to the SCREENED AND COVERED LANAI. There is a formal Living and Dining room for entertaining and family gatherings. The second floor features 5 bedrooms including the OVERSIZED MASTER SUITE with a sitting area plus walk-in closet, his and her sinks, and garden tub with separate shower. Other features include: Water softener, upstairs laundry room, low HOA, NO CDD FEES, Rain Gutters, lots of closets & storage and more. Located in the Lake Talia community, one of the area's most POPULAR GATED COMMUNITIES with two access points. 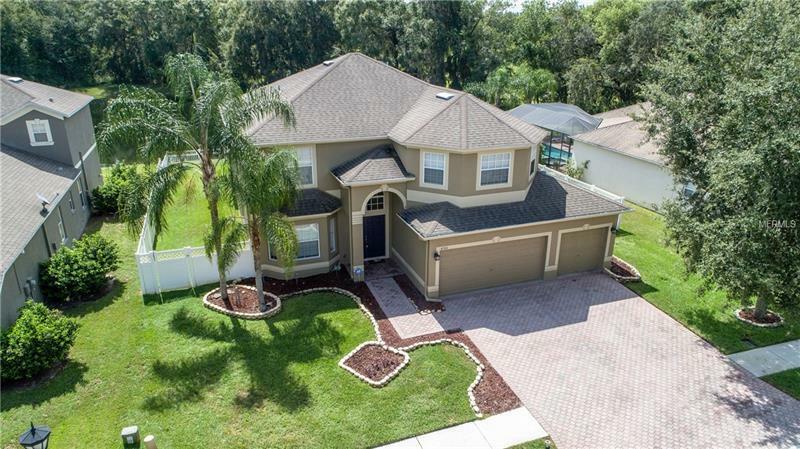 Great school district, walking areas, close to all of North Tampa area restaurants and just 20 mins to Tampa Premium Outlets in Lutz & 30 mins to TIA.